I started this around February. I built a smaller stand to see if my carpentry was good, originally for a 60 gallon tank. Then a friend who collects tanks (he works with the LA Sheriff's Dept with wildlife, fish & game), had one I fell in love with, a 90 gallon and built a completely different dimensions of stand with anticipation of slightly larger dimensions than he gave me. When i brought the two together, they matched up PERFECTLY. In a carpentry/framing state of mind, that NEVER happens. So, after scheming all of this, I set a realistic budget of approximately $1700, a medium priced for a reef tank of this size. Nothing in it is automated, nothing wireless, everything using analog timers and the most basic of sensors and circulation. I also chose to dive in and get as many pieces used as possible. So far, I am only about $500 in, and i might land just shy of $1,000,which is remarkable for a project of this magnitude. 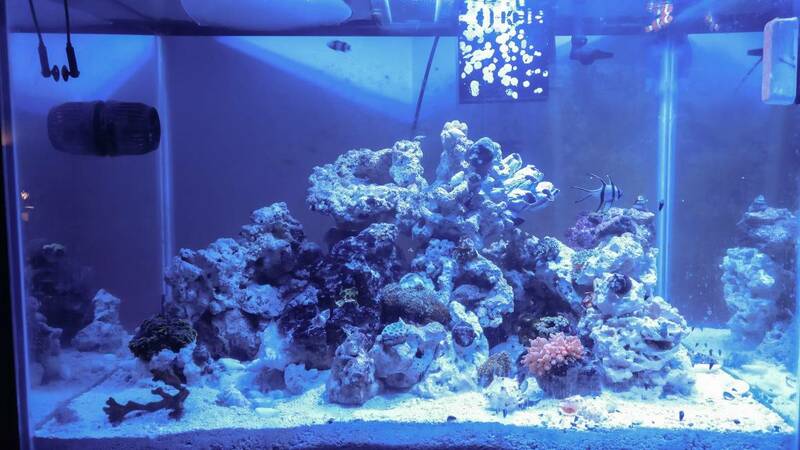 This one is clearing up 10x faster than my first reef. Almost done setting this baby up. I still need to plumb the majority of things, but I've got most of my other tank's residents in. I love seeing your tanks. My budget went way low, and all I need to do now is skin it to be "complete." I also went to OC Pet Expo this weekend and am about 7/10th of the way sure about the light I think I will get to streamline the look of this tank. There is one other tank that is about 60 bucks more that I keep Himming and Hawing over, but I should know for sure by the end of the week. I went ahead and took the plunge on the most expensive piece of aquarium equipment i have ever purchased and bought a brand new JBJ Led sl 140 through amazon. It was about $100 bux less than retail, and $80 less than a similar competitor. It arrives tomorrow, and I am anxious as hell. 2) closeup of my refugium's macro algaes (special ordered all of these from Florida.) they are red because they are grown under a separate light normally used for hydroponics. 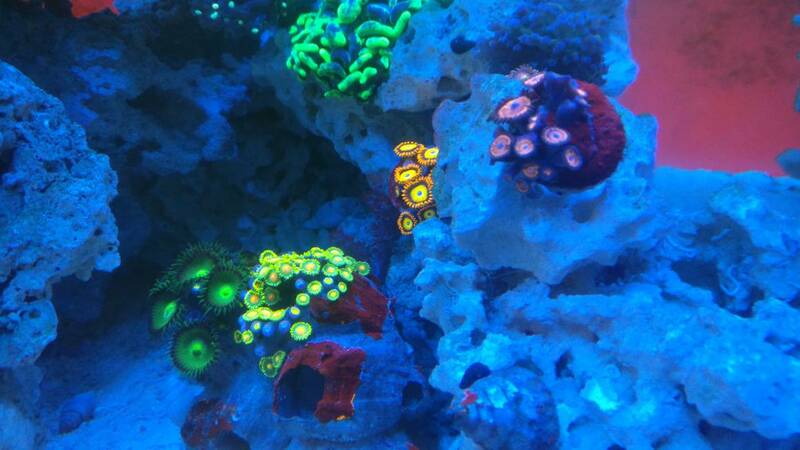 3) close up shot of my Euphyllia corals and my 'nem. I bought a new light, my most expensive individual piece of investment on my whole adventure through this hobby,which is ironic ,really ,when you stop to consider that this whole thing is a visual experience. Regardless, so far, i am more than satisfied with the money on spent on this piece of hardware. Here are the newest pics. That's a serious tank of water! Another piece of the puzzle! I went to Pet Kingdom in San Diego yesterday, for a meeting with my FW club. In addition to Pet Kingdom, we stopped by PetZone (FW Only, but very impressive stock), Aquatic Warehouse, and the Petco. I had a transaction error at Pet Kingdom and got a double charge, which I discovered while at Aquatic Warehouse, so I didn't want to buy anything (I'm stingy like that), and after that, it took AquaSD out of the question. -- There is always next time, and Pet Zone will be one of our next meetings in the future. At Pet Kingdom, I discovered a Yasha Hase Goby for sale. I had been looking throughout the IE and SGV for the past two months for one, and to no avail. A couple of stores had gone to the wholesaler and been unable to locate one, as well. This one, according to the sale associate, had been there for 2 and half months, and never came out of the rock work, so no one knew it was in there. I bought it, brought it home, gave it a couple hours in QT to adjust (After the 3 hour ride home), and dropped it into my DT around Midnight last night. Less than 12 hours in the tank, this happened. I had not seen the Pistol in months. Not since February, or March. I knew the pistol was in that piece of Live Rock, as it continued to fire away at night, but I had not seen it since the day after I had put it in the tank. I tried a couple mediocre traps, and instead just decided to pull it from the tank and put it into the new one. Those SD stores have got something amazing going on. I really like how much space that most of them have, and their stocking is quite good. Plenty of $5 frags - nothing spectacular in that price window, but at least they are there. One more video, this one to show scale of how little these guys are. You should open a reef store or company. That is a tremendous complement @merkus, but i am a complete n00b when it comes to aquariums. I would probably love running the day to day operations of an aquarium store, but the guys who currently exist in my area have the market cornered. I do often romantically fantasize about it, but for now i still have much to learn. You have a passion for it. As that saying goes, find something you love to do and you'll never work another day in your life.